What a name that is. Some never heard it. Some heard it too late. Those who heard it received it second hand, or they were not on the wrong end of his gun. If they were there, and somehow survived, it was because he saw fit to spare them. A tall, lean, wide-shouldered man with a hard-boned face was Hondo Lane. There was no softness in him, yet also no cruelty. At heart, a kind man, with gentleness in him that was hidden and well-protected. To show kindness and compassion at the wrong moment in his time could lead to a quick end. And Hondo Lane is not interested in dying soon. But at the beginning of his story, that seems hard to avoid. A couple of young Apaches shot his horse out from under him, thinking to make a quick kill. They end up dead alongside the horse – but a man without a horse in the desert is a man who will not live long. Then Hondo comes upon a little ranch house in a nearby valley. In the house are Angie Lowe and her son, Johnny. They are situated smack dab in Apache territory, and currently the Apaches are not happy. They are on the war trail. This is why Hondo lost his horse and was almost killed. The treaty made with the Apaches has been broken, and now they want the white man to pay. So the U.S. Army has moved in to take care of the trouble. Hondo is carrying dispatches for the Army, since he is a scout for them, and he needs to get them to the nearest fort as soon as possible. To do that, he needs a horse. Angie Lowe has two horses to choose from, and she allows Hondo to pick out and borrow one. But she dismisses Hondo’s warnings about the Indians. Angie tells him that the Apaches have always gotten along well with them, and that her husband will be back soon. Hondo, however, has read the spoor around her land. Not only are the Apaches running around the place on their way to war, the hoof prints from her husband’s horse are old. He has been gone a long time, long enough for the ranch he has not been taking care of to fall into further disrepair. To pay for his meal, bed, and horse, Hondo sharpens the family’s axe and chops wood for them. He also re-shoes the plough horses, whose hooves have grown over the old shoes. He tells Angie again that she would be safer coming with him out of Indian Territory than staying in it, even if the land is hers through inheritance from her father. He also tells her that she is an “almighty poor liar,” and he knows her husband is not present or coming back any time soon. Angie is most upset by this. Her husband, who was raised with her on the ranch, is actually a bum. The guy works little on maintaining the ranch and goes on “trips” to the fort and nearby towns. There he gambles, drinks, and pays attention to the saloon girls. Meanwhile, Angie is left to mind the ranch and raise Johnny. She cannot handle the ranch alone, but she loves it and it is hers. So she is determined to take care of it to the best of her ability. But most of what upsets her is that she likes Hondo. She likes him very, very much. Of course, being married to another man, for better or worse, that kind of puts a damper on things for her and Hondo. The story spins its way out from here, readers, and this is as much of the trail as I am going to guide you on. From here on, you will have to saddle, bridle, and rope this book yourselves. If you do all that, then you may do to ride the river with. If you have already crossed this and other trails of Louis L’Amour’s, then I salute you and am happy to ride in your company. 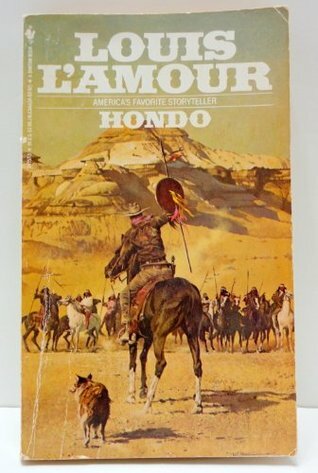 Hondo was Louis L’Amour’s first full-length publication. Before Hondo was published, Mr. L’Amour had only produced short stories for various magazines. Hondo was his breakout novel. After it hit the market, he had no need to look back. He was off to the races, and he kept going till the end of his days. John Wayne was in a film based on Hondo. The film goes by the same name as the book. It is a good film – a great one, I think. And before some of you say that it is just a “cowboy movie,” let me step in here and make something clear. A “cowboy” is someone who “punches cows.” He manages another man’s herd for him, whether it is cattle or horses. He helps with the branding, driving, and protecting of the herd from outside attackers. Hondo is not a cowboy. He is a scout for the Army. So when John Wayne played Hondo Lane in the film Hondo, he played a U.S. Army scout. There is plenty of daylight between the two positions, as much as there is between a military sniper and a beat cop. Do not ever go mixing the two up – especially around me. You get that story straight, and you’ll do to ride the river with. This entry was posted in Book Reviews and tagged Angelique L'Amour, Angie Lowe, Apache, Apaches, Army scout, Book Reviews, books, books about the old west, Hondo, John Wayne, Louis L'Amour, Old West, old west fiction, the American West, The West, Western novels, westerns on October 28, 2016 by The Mithril Guardian. Those of you who have attended to this blog for any length of time will recognize the title of this post. If you were to type The Cherokee Trail into the search engine on the right hand side of your screen, you would probably get more results than I care to calculate. At the dawn of this blog’s existence, I wrote a post about a book which contained many quotes from Louis L’Amour’s stories. This book had been compiled by the famous author’s actress daughter, Angelique L’Amour. And yet, despite the fact that he is one of my favorite authors, I have not reviewed a novel written by the man who brought the West to life for so many people. That ends today, readers. This post is about The Cherokee Trail, written by Louis L’Amour, published in 1982. The Cherokee Trail focuses on one M. O. Breydon, the widow of Major M. O. Breydon. Mrs. Mary O. Breydon is on her way west with her daughter, Peg. She is riding the stagecoach to Cherokee Station, a stage station along the Cherokee Trail. This station is where her husband planned to get a job. Since he is dead, murdered by guerrillas, the job has fallen to her. She needs the money, and she intends to hold this job no matter what. Mrs. Breydon and Peg are not the only passengers on this stage. There is an Irish girl just a few years younger than Mrs. Breydon herself and a well dressed, heavy set man. There is also a younger man, seated at the opposite end of the bench across from her and her daughter, whose insinuating glances discomfit Mrs. Breydon. And there is a young, grey eyed man with three pistols in his belt and a black hat pulled low over his face who is seated right next to Peg. The Irish girl, Matty Maginnis, initiates a conversation with Mrs. Breydon, which the men enter in on. During this conversation it is revealed that Cherokee Station is run by an uncouth drunk named Scant Luther. The man has a bad reputation and no respect for women. Nevertheless, Mary Breydon plans to dismiss him as her husband would have. And she plans to take his job, which her husband accepted before he was murdered: the management of Cherokee Station. Well, the stage pulls into the station, a soused Luther comes out, and a scene ensues. Mary Breydon has the letter giving him notice of his discharge and replacement read out loud in front of him and the other stage passengers. Luther does not take kindly to being replaced – especially by a woman from back East. He sits down in the doorway of the station and challenges Mrs. Breydon to fire him. And fire him she does – with a horsewhip! Right in the middle of his statement of the rules for the challenge, she takes the stage driver’s whip from his hand and it is obvious she knows how to use it. Four lashes later, plus one hard look from the grey eyed man on the stage, and Luther decides to hustle on out of the way. For now. Mrs. Breydon cleans up some of the mess he left behind in the station building and gets a suitable lunch set out for the passengers. Two of the men ride on in the stage while Matty remains at the station, taking Mrs. Breydon’s offer of a job as maid and cook. The grey eyed man, Temple Boone, decides to stay the night as well, since he has a horse waiting for him in the station’s stables. In addition, Mrs. Breydon finds a young boy named Wat Tanner standing outside the station building. She invites him to work for her as well, and he agrees, so long as its “man’s work” and not “women’s work” – such as washing the dishes! The Cherokee Trail was, I believe, the first novel of Louis L’Amour’s which I ever read. It not only impressed me, it made me hungry for more. Mr. L’Amour led a colorful life, and he wrote something on the order of over two hundred books. He used a variety of pen names before signing his books with his real name. 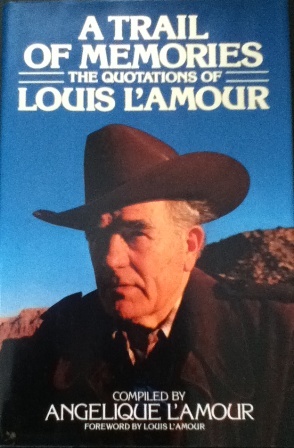 Apparently, the publishers did not believe a name like “Louis L’Amour” would catch people’s attention. John Wayne – real name Marion Morrison – had to use a pseudonym in his work for similar reasons. Louis L’Amour researched all his novels carefully, and the Author’s Note which precedes The Cherokee Trail proves it. Someday soon I will review another novel of his. For the time being, readers, you have an assignment: search out and read The Cherokee Trail. It is worth the hunt, and if you do not love it for any reason, I am truly sorry to hear that. If you do like it – welcome to the range, partner! We’ve been expectin’ ya! This entry was posted in Book Reviews and tagged American West, Angelique L'Amour, Book Reviews, books, books about the old west, Louis L'Amour, Old West, old west fiction, Quotes, the American West, The Cherokee Trail, The West, Western novels, westerns on July 29, 2016 by The Mithril Guardian. Are those the Saturday comics? All right. But I get a look afterward. Deal? So today I thought that I would tell you about A Trail of Memories: The Quotations of Louis L’Amour. It was compiled by his daughter, Angelique L’Amour; she’s an actress. Wow, what a book! It doesn’t have quotes from all of L’Amour’s books, but that would be a tall order for anyone to compile, he wrote so many! Many of the quotes come from L’Amour’s The Walking Drum (set in twelfth century Europe), Comstock Lode, several of his Sackett stories, a number of his Westerns, and Last of the Breed (which is a good book). The thing is, that probably actually happened!!! L’Amour always finds a way to make a situation or a conversation funny at some point in his stories. I have got to find and read Comstock Lode, if only to see where this quote fits into it! I have to admit, though, H.M., that the most interesting part of this book is Ms. L’Amour’s introduction. She talks about her experiences with her father growing up; how they would act out parts from his stories, how she learned to read early in her youth thanks to watching her father write, and so on. But the really interesting thing she says is that, even when she wrote A Trail of Memories, single mothers were still writing to her father. Why? Now we come to the fascinating part. These women would write to him telling him that they held up the characters in his stories to inspire their sons. They used his characters to teach their sons how they should behave, how to be gentlemen. They said that they used his characters as role models for their boys. It is impossible for me to tell you how startling and moving this admission is. I mean, is there any higher praise for a writer? To know that there are people out there who use the characters in their story as role models for real life? It’s sad in some ways, Murdock. Characters and stories were always meant to teach people. They were to remind the world that ideals and principles should be striven for, no matter the cost or the number of falls involved in at least attempting to reach them. Today many writers forget that. And that is a very sad thing. Still, A Trail of Memories is an absolute feast for any L’Amour fan, and a good way of getting new readers curious about his stories. The Foreword and Introduction are both wonderfully illuminating (and both have the characteristic L’Amour wit), and the quotes ought to be tacked onto the walls of a room until they appear to be the walls. So when you get the chance, I highly recommend it as a read! Now can I have the comics’ page? Thanks. See you around, Murdock! This entry was posted in Book Reviews and tagged Angelique L'Amour, Book Reviews, fiction, Louis L'Amour, old west fiction, Quotes, Role Models, Single Mothers, Teaching on June 8, 2013 by The Mithril Guardian.